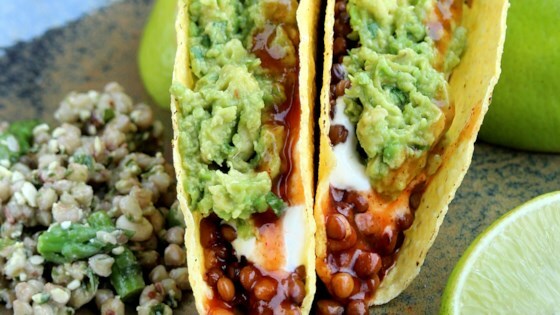 "This vegan version of classic tacos uses lentils instead of ground beef, along with other flavors so good you'll never miss the meat!" Combine ancho chile powder, cumin, coriander, oregano, salt, and fennel in a small bowl. Heat oil in a large skillet over medium-high heat. Cook onion and garlic, stirring occasionally, until lightly browned, about 3 minutes. Add spice mixture and cook, stirring, until toasted, about 30 seconds. Reduce heat to medium and add cooked lentils, tomato paste, a few splashes of water, and chipotle peppers. Cook, mashing lightly with a fork and adding water if necessary, until lentils are heated through and hold together, about 5 minutes. Season with additional salt if needed and adobo or hot sauce. Lightly toast tortillas in a cast-iron skillet over medium heat. Spread about 1/3 cup filling down center of each tortilla. Top with lettuce, tomatoes, and cilantro. Serve with guacamole and lime wedges. For 2 1/2 cups cooked lentils, use 1 cup dried. Bring 3 1/2 cups water and salt to a boil in a saucepan over high heat. Pour lentils into the water while stirring constantly. Reduce heat to love; cover. Simmer until lentils are tender but still hold their shape, about 30 minutes. Drain well. You can substitute 1 1/2 (15-ounce) cans of lentils, rinsed and drained. Nice substitute ‘meat’ for vegetarians. I made a large pot and then turned it into meatloaf, tacos and pasta sauce over the week. Highly recommend! I've made this recipe a few times already in a month as I have two vegans in my family. These are great, wouldn't change anything in the recipe! This was our first recipe in our attempt to eat vegetarian for 30 days. We all thought this recipe was outstanding - better than beef tacos. We will keep this one forever.